So I’m a self prescribed GinZing addict. 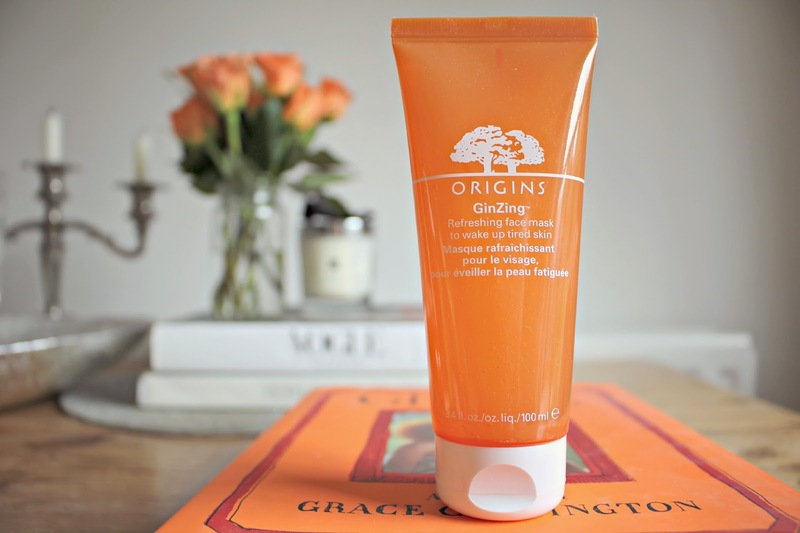 I LOVE the whole range from Origins so when a HUGE box appeared on my doorstep with an Origins label attached, I tore it open with delight and jumped for joy to find a new GinZing launch hidden inside, along with tips and tricks for how to blend it with other face masks from the brand (more on that later!). Their newest launch from the popular range is the GinZing refreshing face mask – different to any face mask i’ve tried before, this mask promises to refresh tired skin, and give lack-lustre complexions an instant boost. The mask is a cooling gel which can be left on for 10 minutes before tissuing off. Usually I apply face masks in the evening and then shower off, usually with my Clarisonic, but I applied this one in the a.m to give my skin a boost for the day. It’s ideal for this heatwave we are having right now, as the formula is very cooling on the skin, and the mask is also formulated with coffee beans (like the rest of the GinZing range!) which perks up your complexion. It’s hard to describe the results; after tissuing the mask of, my face felt pleasantly tingly and certainly perkier! I can imagine picking this up in future after a late night, with the grapefruit and lemon fragrance calming and invigorating. A lot of the mask is absorbed during the 10 minute application time, giving moisture to dehydrated skin. I have oily skin usually but my skin still loved taking in the nourishing ingredients from the mask. So yet another product that I LOVE from the GinZing collection! If you haven’t tried the range yet, then you really must! If you try one thing, I would still recommend the moisturiser – in fact it was one of my first ever beauty review posts on the blog – which you can read here. Other products that I’ve tried and loved include the Face Scrub (review here), Mascara (review) and Eye Cream. Oh and I almost forgot – I think this may be a sister product to the GinZing range but also the VitaZing Energy Boosting Tinted moisturiser (read me). So fair to say I’m pretty obsessed with GinZing! Will you be trying the GinZing range?